You can let your student know you're thinking of them by sending an MGift Package. 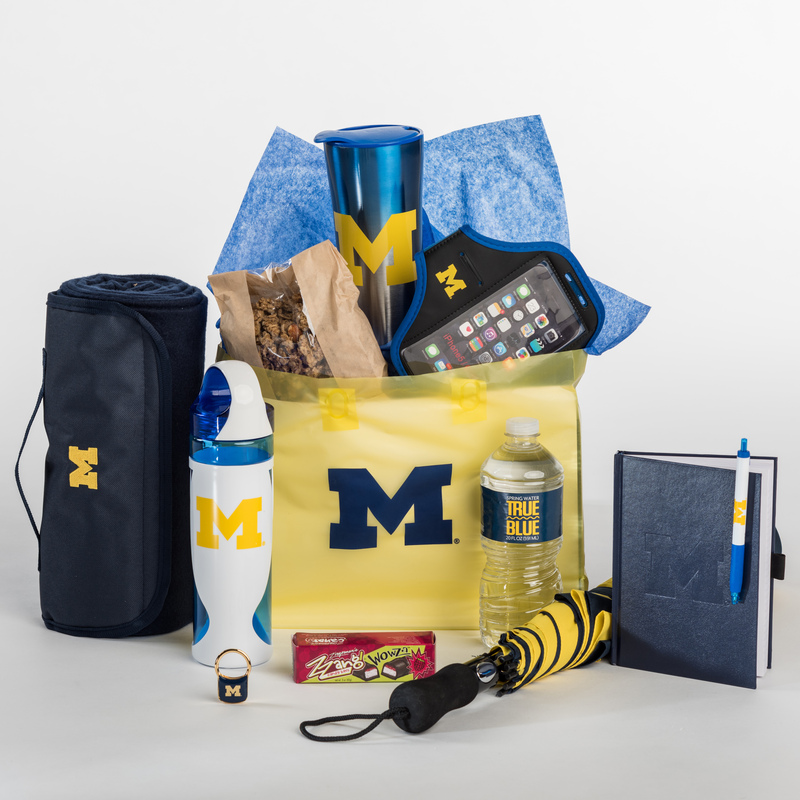 U-M Spirit Bag -- Graduates would enjoy the momentos included in this fun package: reusable water bottle, travel coffee mug, key chain, “Block M” umbrella, pen, notebook, stadium travel blanket, True Blue 20oz water bottle, arm phone holder and M|Dining granola. Stress Buster MGift Package -- For your student who is deep in finals study, the Stress Buster can provide a study snack break and breather with this big selection of goodies to get any student through exams: bottled soda, crunchy snacks, assorted candy treats, and a U-M travel coffee mug. MGift Packages are also available with themes such as Get Well Soon, Movie Night, and Good for U. They are filled with healthy snacks and U-M items. Simply place your order by 4 p.m. (EST) two days before you want it (available Monday-Friday) for pick-up at an MDining retail location or your student's residence hall community center. Proceeds of MGift Packages support U-M student programs and campus facilities.